One man's fish slime is another man's delicious, faux egg white. Hagfish have naked, loose-fitting skin (think naked mole rat) and are scavengers who search the ocean floor for dead or dying creatures, burrow inside, and eat their way out. They also have many nicknames, none of them pleasant. Commonly referred to as both “slime eels” and “snot snakes,” hagfish are actually neither snakes nor eels, but jawless fish. The misnomers come from their eel-like appearance, and their notable ability to excrete up to 20 liters (around 5 gallons) of milky mucus when under stress. The mucus is a unique defense mechanism that has allowed hagfish to roam the oceans for 300 million years. When a predator attacks, the hagfish’s slime coats its gills, suffocating the predator. But while the slime puts off many human predators, it’s also part of the hagfish’s gastronomic appeal in Korean cuisine. 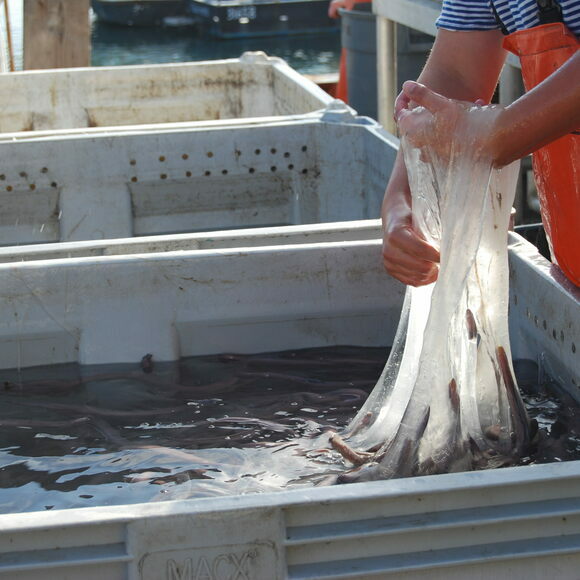 Since hagfish slime is fibrous and full of protein, it’s regularly used as a substitute for egg whites. To this end, hagfish are sometimes kept in cages, which are rattled and hit to agitate the fish, and the resulting slime collected. In Korean fish markets, it’s common to see hagfish skinned alive and grilled with onion and garlic. In the cruel spectacle that follows, hagfish writhe in snotty circles until they are killed, cooked, diced, and seasoned with a red pepper sauce. They can also be broiled in sesame oil, salted, and served with a shot of liquor. Like many phallic-looking animals, they’re valued as an aphrodisiac. Hagfish slime isn’t just edible; it’s also an incredibly strong and versatile material. Its fibrous threads are 100 times thinner than human hair but ten times stronger than nylon. Researchers are trying to find ways to use hagfish slime in everything from airbags to bandages to bungee cords. Engineers in the U.S. Navy even hope to create an artificial version of the slime for missile defense systems. Hagfish, live or cooked, can be found in seafood markets all over Korea. It’s also served in Korean restaurants in Japan and, to a lesser extent, Korean restaurants around the world. This famous fish market in Korea's second-largest city is a good place to find hagfish. Slice open this rock-like sea creature and you'll find tomato-red flesh that tastes great in Chilean ceviche. The rarest oysters come from the bottom of the sea at the end of the earth.